When planning for a trip, there are several hurdles to jump through. One of which is applying for a visa! Ed and I have been traveling once or twice a year, but we still dread visa applications - the stress in gathering all the requirements, the agony in waiting for the visa to be released, and mostly, the fear of receiving a refusal letter instead of a visa stamp! That's why it took us awhile to visit Paris... because first and foremost, we needed a Schengen Visa! But this year, we decided to go for it! Stress, excitement and all, I'm happy to share the timeline of our Schengen Visa for France Application for our October 2016 Paris Trip! Before we proceed, please note that Schengen Visa application should be submitted at the Embassy or Consulate of the country you intend to visit. If you're traveling to multiple countries, submit your application at the Embassy or Consulate of your first point of entry or your main destination - the country where you will be staying for the maximum number of days. We have been thinking about celebrating our 5th wedding anniversary somewhere special since the first quarter 2016, but it was only on July that we seriously planned for a trip to Paris. We spent days reading the visa application process in VFS Global website and on July 31, Ed downloaded the forms to be filled up and the document checklist. We prepared the application form and supporting documents needed for Short Term Visa for Tourist. Ed and I applied as a couple, but each of us has to submit the documents required. Copy of Passport personal data page - Bring at least 2 copies! Copy of previous Schengen Visa - only for Ed. He went to Italy 9 years ago. Original Letter from Employer - must include current position, monthly salary, date of employment and purpose of travel. Both our letters did not contain the words "for the purpose of tourism", I highly advice that this should be indicated to avoid further questions. Copy of last 3 months Bank Statement - We submitted original and stamped bank statements. No specific amount required, you simply have to show that you have enough money to cover your trip expenses. Copy of Itinerary - We submitted the actual travel itinerary that I made for our trip. Copy of Overseas Medical Insurance - must be valid for all Schengen countries, with minimum coverage equivalent to € 30,000. We got our Travel Easy Elite insurance plan from Oman Insurance through a travel agency. Copy of Confirmed Air Ticket - We purchased Gulf Air DXB-CDG round trip tickets; the cheapest flight with the shortest lay-over during our date of travel. It's also refundable, just in case the visa application gets denied. Copy of Confirmed Hotel Booking - We reserved a 4 night stay in a budget hotel in Paris' 17th arrondissement. By the end of August, all our documents were ready, and on the 1st of September, we scheduled an appointment for the visa application at VFS Global-France website. We chose the date and time, and paid the service fee of 92 AED per application. A Premium Lounge can be booked for additional fee. Since we were not in hurry and the premium fee will have no effect on the processing period anyway, we settled with the visa application in the General Lounge. September 4, 2016 - This is THE DAY! We went to VFS Global office in Wafi Mall with our appointment letter and documents. Our schedule was at 9:30 AM, but we arrived an hour early. So, what happened on this important day? Bag and body check at the entrance! Only hand bags and folders are allowed inside the office. Ed had to leave his backpack at the counter. In the reception, we presented the appointment letter and the receipt that we printed when we scheduled the appointment. Then, a number was given. We waited for our number to appear on the screen at the General Lounge. We were the first applicants for France; hence we didn't have to wait any longer. We went to the counter to present our documents. After thorough checking, the staff took all the required documents and returned those that are not stated in the checklist. 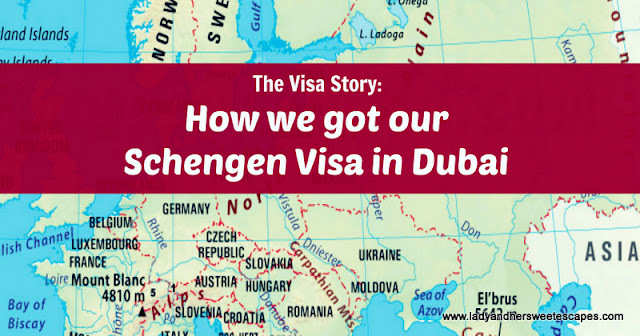 We paid 245 AED for the visa, 5 AED for the SMS fee and 30 AED for the courier fee at the same counter. Fees stated are per application. The SMS and courier service are optional. And lastly, photo and fingerprints were taken in the Biometric room. On the same day, at 8 PM, we received an SMS from VFS Global that our visa application has been dispatched to the Consulate General of France for processing. Two days after we applied for the Schengen Visa, we received another SMS from VFS Global stating that the processed application has been dispatched via courier. No indication if we've been approved or not. Unfortunately, I was on sick leave when our passports were delivered to my workplace. Most likely because of the stress brought by the visa preparation! Or perhaps, I was simply overthinking! Too impatient to wait for the next day, Ed called the courier office if we can pick it up ourselves in the evening. They agreed; hence on September 7, 2016 at almost 9 PM, Ed and I received our parcel containing our passports, each stamped with a Schengen Visa for France, multiple entry and valid for 3 months although we only applied for single entry! Woohoo! There's a small note clipped on our passports indicating that we should be ready to present documents like hotel booking and round trip air ticket at the immigration. These documents were not asked during our entry in Charles de Gaulle airport in Paris, but better prepare copies. Disclaimer: We are not connected with VFS Global. This blog post contains our personal experience during our Schengen Visa application. Please visit www.vfsglobal-fr-ae.com to know more about the visa application process.